When working in AutoCAD Electrical there are several tools you should be using on a regular basis if you want projects to remain accurate. Many times people use AutoCAD Electrical and get frustrated when their projects do not run reports correctly, or do not seem to remember the links to components. Most of the time it is due to not knowing important tools that should be used that update, and correct, potential errors. If you think your drawing has been corrupted by someone using standard AutoCAD tools on your AutoCAD Electrical drawing you will want to use the DWG Audit tool to clean it up. This happens when the AutoCAD Erase tool, or the keyboard delete key, was used on electrical components when the AutoCAD Electrical Delete Component tool should have been used. 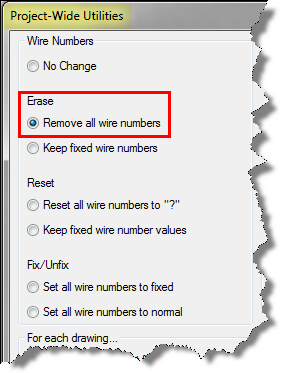 If you think you are having issues with wire numbers you should run the Project-Wide Utilities tool to remove the wire numbers from the drawing prior to running the DWG Audit tools, and then rerun the Wire Numbers tools to put them back on after everything has been cleaned up. After removing the wire numbers run the DWG Audit tool. Then run the Wire Numbers tool to put the wire numbers back on the drawing. Doing this procedure will insure you removed all the bogus wire numbers otherwise you would have to search the drawing looking for wire numbers that do not belong where they are. Now that your drawing has been cleaned up you will have the confidence to run the Project-Wide Update or Retag tool. After the dialog box opens select the three options in the upper left hand corner. 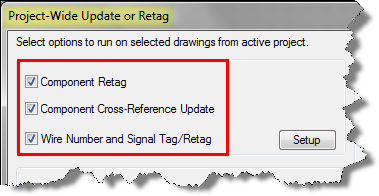 Component Retag, Component Cross-Reference Update, and Wire Number and Signal Tag/Retag options. Knowing the right tools to use to keep your drawings electrically smart will give you the confidence to run the update tools. The most common reason people cannot run the Project-Wide Update or Retag tool is because the drawings have been corrupted using the AutoCAD Erase tool, or the keyboard delete key, on electrical components when the AutoCAD Electrical Delete Component tool should have been used. Now that you know how to clean a drawing up you should have the confidence to run the Project-Wide Update or Retag tool.